The Best Books Ever: Best Book Ever: Book-to-movie Adaptations! Best Book Ever: Book-to-movie Adaptations! This week on Best Book Ever, we're talking about books, but we're also talking about movies. That's right, we're talking about our favorite book-to-movie adaptations. Sometimes, a movie gets it just right, and you feel like it's a perfect tribute to a well-loved book. Here are some of our favorite adaptations. Being both a book and movie lover, the release of a great adaptation is so exciting. The best kind of adaptations are not only faithful to the heart of a book, but do such a good job lifting it beyond the page that it actually brings in more readers. So, yes, a part of me feels as though I should pick something less obvious, more original and not so much a given. But I really can’t because I absolutely and completely loved Peter Jackson’s adaptation of J. R. R. Tolkien’s THE LORD OF THE RINGS trilogy [movie | book]. Talk about a crazy and immense task! Tolkien’s world is intricate and complex, sometimes so much so that it feels as though you’re drowning in detail. But Jackson truly does it justice on the big screen. The whole time you’re watching the movies, it never fails to still feel like Tolkien’s creation. THE LORD OF THE RINGS has been a classic in literature for a long time, but it’s the success of the movies that has finally managed to bring it to the mainstream. It’s great to think of newer fans hopefully picking up the books! I think FIGHT CLUB [movie | book] is one of the best book to screen adaptations ever. It kept the gritty feel and unexpected twist of Palahniuk's novel without staying page to page true to the book. Another great example is GONE WITH THE WIND [movie | book]. Moving that mountain of a book onto the screen had to have been quite the undertaking, and the final product doesn't suffer. If anything, the personalities of Scarlett's less entertaining sisters are neatly encapsulated in a few scenes without getting into their rather laborious side plots. I'm feeling nostalgic today, so my choice for best book-to-film adaptation is one of my most beloved stories from childhood, CHARLOTTE'S WEB [movie | book]. (I’m talking about the animated film from 1973, not the live-action version from 2006.) 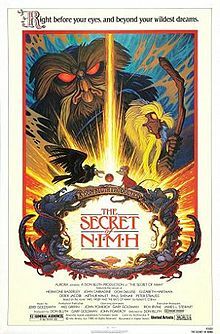 I must have watched that movie two hundred times as a kid, followed by another two hundred times when my sister was a kid. The book is pretty fabulous in and of itself—who’d have thought a story about a friendship between a pig and a spider could be so captivating and poignant? But once you add animation and a slew of ridiculously catchy musical numbers, CHARLOTTE’S WEB approaches perfection. Although I probably haven’t seen this movie since I was ten, I’m pretty confident I could sing you every single one of those songs. (I’m especially partial to the one about how a county fair is a veritable smorgasboard. I find myself singing it all the time.) But perhaps the best thing about this movie is that it’s so true to E. B. White’s characters and themes. Friendship conquers all. We all have lots in common where it really counts. And—a tenet dear to every writer’s heart—a few well placed words can change someone’s fate. Okay, this week's topic is SO TOUGH! I actually like a lot of book-to-movie adaptations, so narrowing it down to my favorite? Whew...But, I finally came to a conclusion: Anne of Green Gables [movie | book]. Yeah, they tweaked the story a little - but it's near impossible to take a straight novel narrative and turn it into a watchable movie. I love the way they developed Anne's character - and Diana - and Gilbert (oh be still my heart, Gilbert). The costumes, the setting, the screenplay, the music, Peter Sullivan did an excellent job turning a book series into two amazing movies. (There's a third movie, yes, but it deviates a LOT more from the story, and came about twenty years later). While I’ve seen many good film adaptations of books, there is only one that I believe actually improves in some ways on the source material — so much so that I actually wish I’d seen the movie first, which is the opposite of how I usually approach these things. Christopher Priest’s The Prestige [movie | book] is a fine novel, with elements of science fiction, romance, and of course magic; but director Christopher Nolan, most recently of The Dark Knight Rises fame, pulls the most surprising trick of all by crafting a film that takes the characters and themes to a whole other level, tightens the plot, and delivers an even more surprising ending. If you aren’t familiar with either the book or the film, I won’t spoil them, but they are both twisty, trippy, and mind blowing, well-suited to the talents of the man who gave us Memento and Inception. I certainly recommend you check this story out on the page or the screen, but I suggest that the film is the definitive version. And it doesn’t hurt that the cast includes the likes of Christian Bale, Hugh Jackman, Michael Caine, and Scarlett Johansson. I always feel very bittersweet when I see that one of my favorite books is going to be made into a movie. The movie never seems as good at the way I visualized it in my head--and forever afterward those actors and that setting taint the way I re-read a story. And the reverse is true too. Once I love a movie, I have a hard time motivating myself to read the book (Case in point: THE PRINCESS BRIDE is one of my all-time favorite movies, but I've never read the book). *sidenote: Bridget Jones is another excellent book to movie adaptation. Maybe the secret is just to add Mr. Darcy Firth? What about you? What's your favorite adaptaion? I'm LOTR all the way. That's just because I'm such a LOTR fan I'd probably faint if I ever saw any of the characters or the director in person lol!!! I dig all the movies on here. Gone With the Wind--what a masterpiece. Anne of Green Gables, LOTR, the Prestige (which reminds me of the other magician movie that came out at the same time, The Illusionist--also an adaptation, also brilliant). Movies, movies, movies.